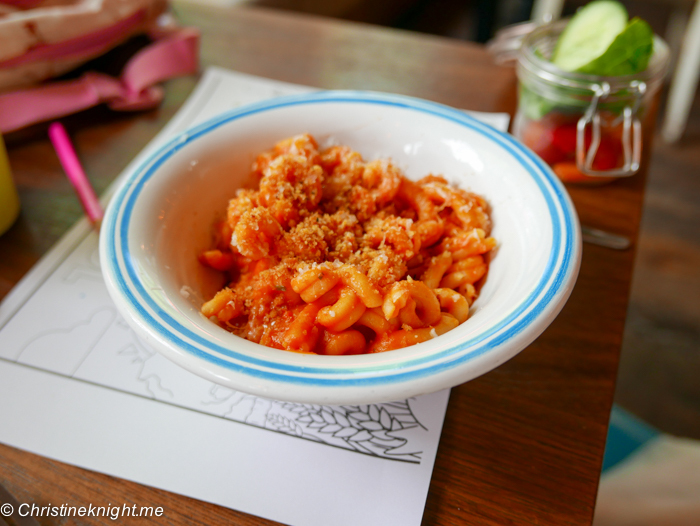 19 Kid-friendly Restaurants in Sydney (that parents will enjoy too) - Adventure, baby! 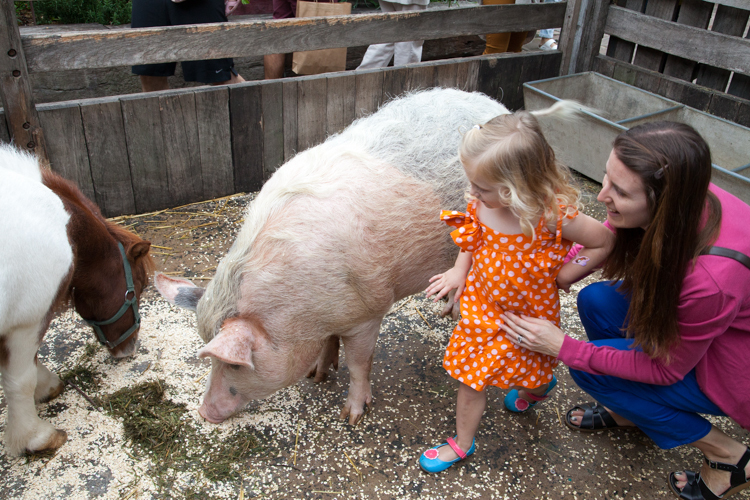 Having a kid these days doesn’t mean your foodie adventures have to come to an end. 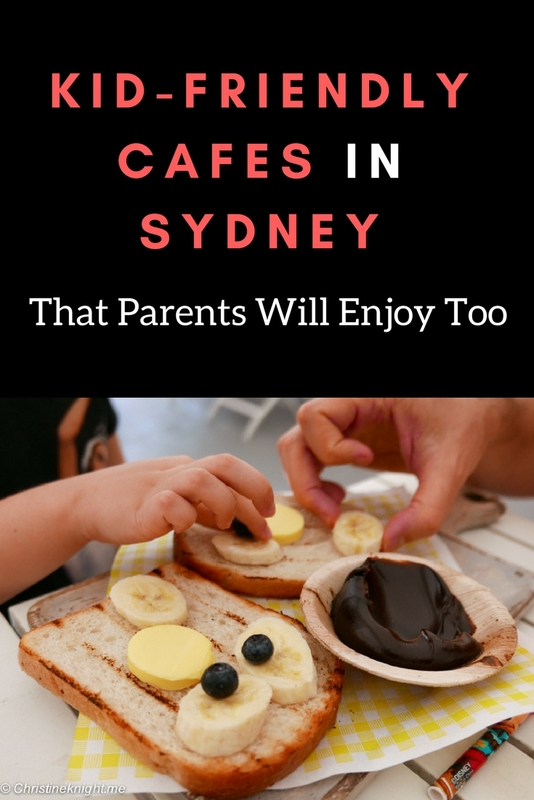 Spectacular Sydney is serving up plenty of delightful choices for families to take their mini-gourmets to enjoy fancy babyccinos along with a perfectly smashed avo. 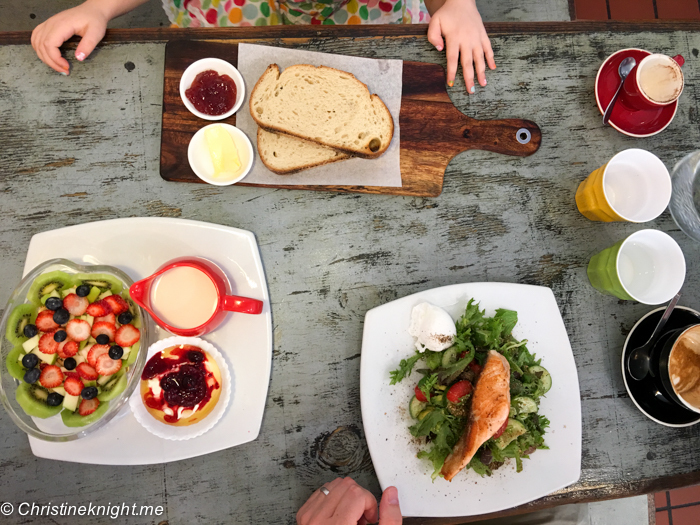 Check out my top kid-friendly restaurants in Sydney – where the wee ones can eat and play while adults dine on fine cuisine. The Picnic at Burwood is a whimsical elevation of the humble outdoor dining experience. The outdoor cafe is located inside a pavilion in a park in Burwood, a few metres from a large, fenced in playground. The menu is delightful and delicious. 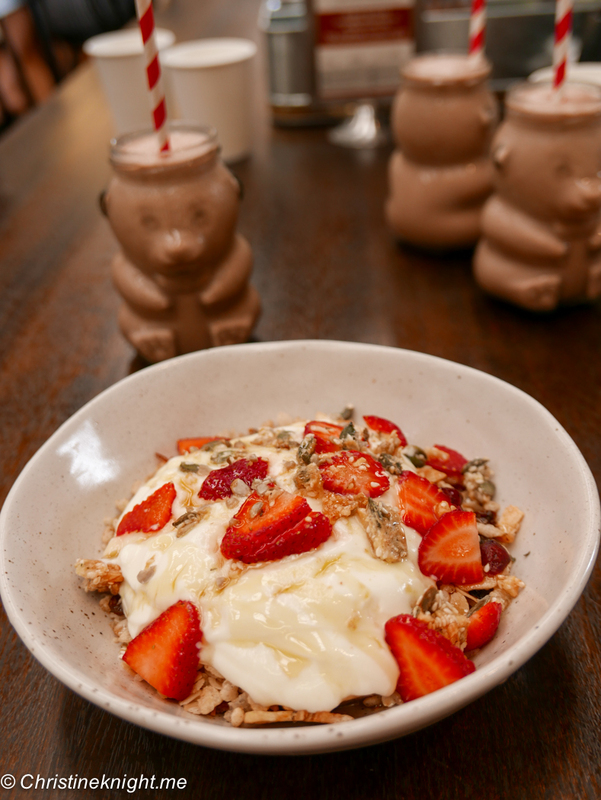 Adults can order the very insta-worthy pavlova hotcakes while kids’ eyes light up to see the adorable “bear” dish of bear-shaped toastwith banana and blueberries.The Picnic is our constant go-to and is always on the list of the best kid-friendly restaurants in Sydney. Get more info on visiting The Picnic Burwood here. Hours: Tue-Sun 8am-4pm. Closed Mondays. 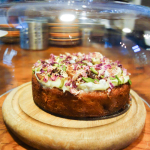 The home of delicious pastry such as the famous watermelon cake as well as quiche that tastes like heaven, Black Star’s Rosebery and Moore Park cafes are perfect places to take the kids to appreciate the finer tastes in life. 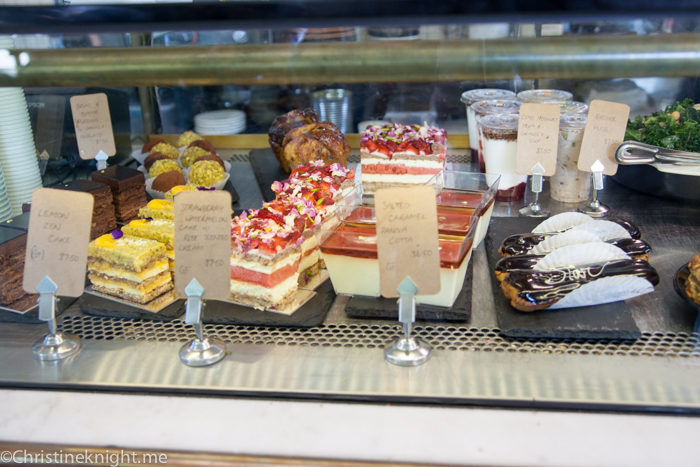 Both have large seating areas with plenty of tables and space for strollers, and the Rosebery one has a nice little set of toys for kids to play with while they’re munching their way through some of the best cake in Sydney. Get more information on visiting Black Star Rosebery here. 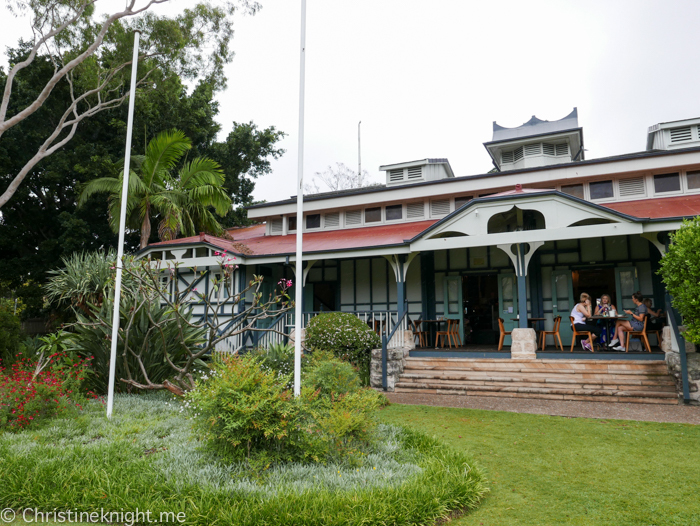 The Burnt Orange cafe is housed in an historic sandstone manor overlooking Sydney Harbour. Adults are spoiled for choice with an extensive breakfast and lunch menu, while kids can enjoy fine dining of their own with options such as the crumbed whiting fillets with chips, pasta spirals with fresh tomato sauce or mini organic cheeseburger with chips served with a smartie cookie and a choice of fresh orange juice, strawberry or chocolate milk for $15. Next to the dining area upstairs is a gorgeous boutique store filled with kids toys and clothes. 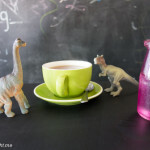 Get more info on visiting Burnt Orange here and on their amazing high tea here. A cheerful little cafe on Annandale, a part of Sydney with loads of young families. A kids play area with sturdy toys keeps little ones entertained while their parents enjoy their baked eggs and fresh juice. While the breakfast menu is light on kids meals the lunch menu has a choices such as the every-popular toastie. Around the corner from the bustling Top Ryde Shopping centre, you’ll find the Groundskeeper Café in Ryde Park. 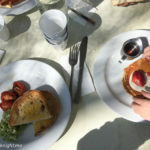 Kids enjoy their own menu section, called “The Little Groundskeeper”, including simple dishes like eggs with bacon with toast, a ham and cheese omelette with toast, pancakes with strawberries and a ham and cheese toastie. Adults will enjoy traditional dishes with a Middle Eastern twist. Outside there is a shaded playground where kids can play within their parents’ view, and a new scooter/bike path has opened up within Ryde Park, too. Get more info on visiting the Groundskeeper Cafe and Ryde Park here. Hours: Mon, Wed, Thurs & Fri 9am-4pm, Sat & Sun 8am-4pm. Closed Tuesdays. 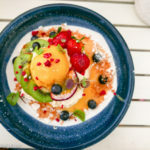 A cafe in the trendy part of Redfern, Three Williams is a delightful surprise for families looking to dine in the area. A peek inside the entrance into the cavernous underground cafe reveals plenty of space. Kids love to race up and down the ramp intended for disabled access, that leads them straight to a giant chalkboard and small play area. The food is fantastic and the staff extremely kind towards their youngest guests. Get more info on visiting Three Williams here. This cafe is constantly rated one of Sydney’s best for a very good reason. The Grounds of Alexandra is a cornucopia of whimsical delights. From the farm animals (meeting the famous pig, “Kevin Bacon” is a must) to the play area, fountain and rambling paths leading through gardens and lanes bursting with flowers, statues and tiny creative details, the external grounds at The Grounds is, in itself, worth a visit alone. 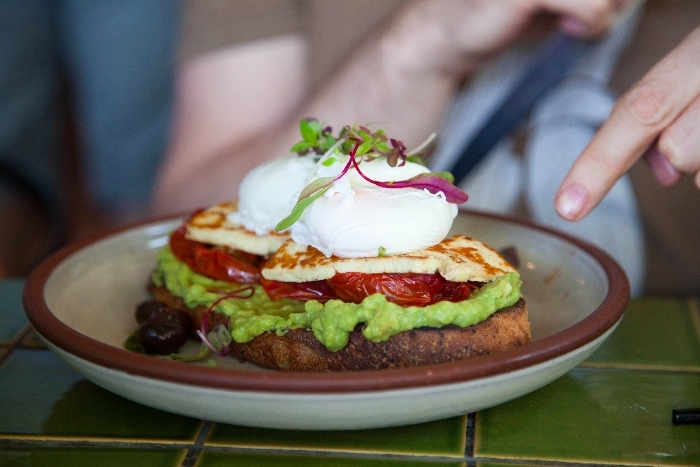 The food is excellent: the popular “signature avocado” set a new standard in smashed avo brekkies when introduced a few years back. 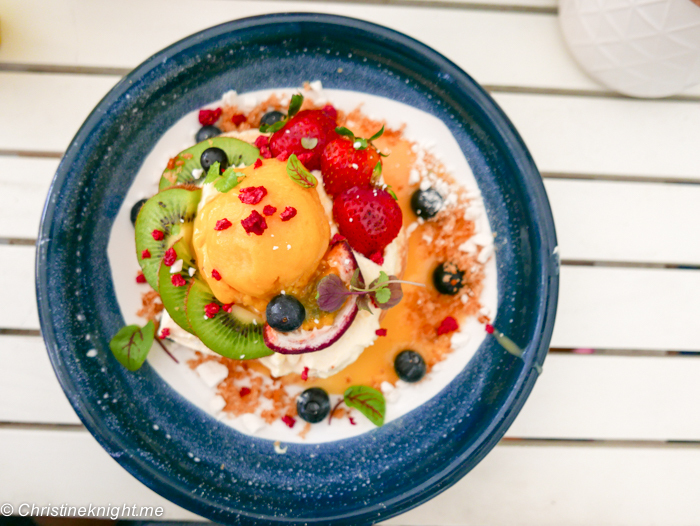 The Grounds is such a special place to visit that it is always right up the top of lists mentioning the best kid-friendly restaurants in Sydney. Get more info on visiting The Grounds of Alexandria here. 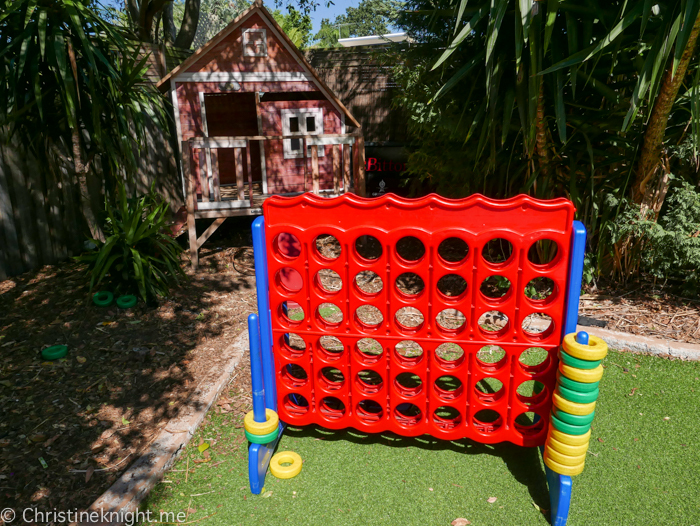 Ask for a table out the back next to the small toddler play area when dining at Bitton Gourmet with littles. 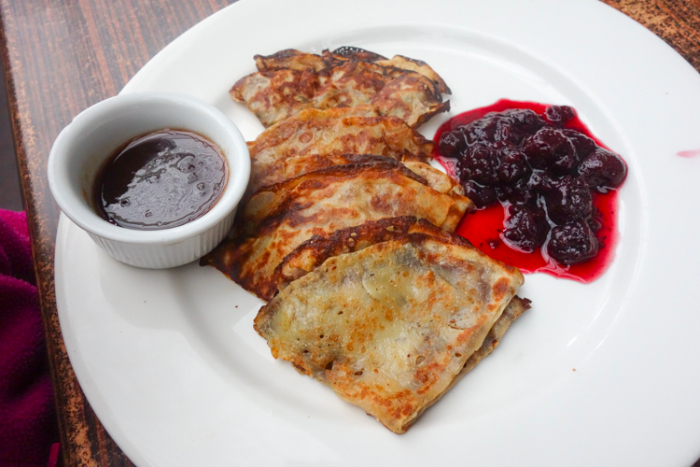 Adults enjoy the delicious French-Australian cuisine while the kids love that they have somewhere to play while waiting for their scrambled eggs. We love their all-day breakfast menu and the can-do staff who are always happy to help in anyway they can. 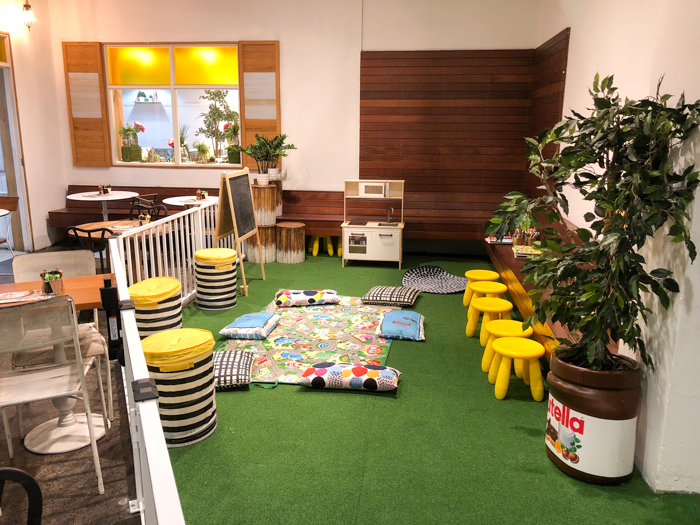 Bitton Gourmet can now be found at Oatley, too, where they have the same menu in a bigger venue with a backyard and play area for kids (photo above). 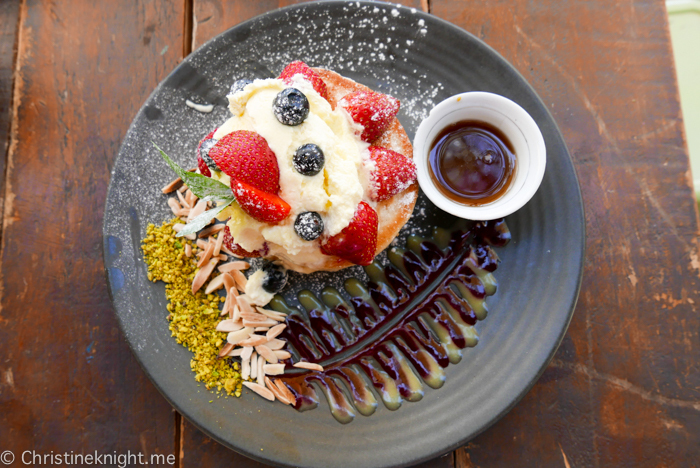 Get more info on visiting Bitton Gourmet Alexandria here and Bitton Gourmet Oatley here. Hours: Wed-Sat 7am-9pm, Sun-Tues 7am-4pm. A popular cafe for families on Sydney’s North Shore, the cafe is inside old incinerator that has been given a new lease of life. Outdoor tables and grassy areas give kids plenty of room to roam while their parents enjoy “Have it your way” free range eggs and Ti Tam milkshakes. A nearby playground provides a convenient place to let kids run around if there’s a wait for tables. 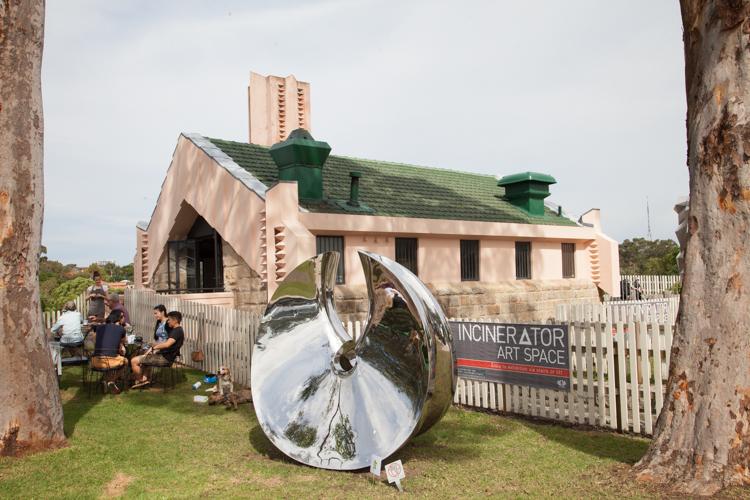 Get more info on visiting The Incinerator Cafe here. Head to the back of the Coogee Pavilion to find a paradise for kids and their parents. Giant games of Connect Four and Scrabble, building blocks, board games and a colouring table entertain the kids, leaving adults free to enjoy a well-deserved drink. The wood-fire pizzas are our fave dishes to order. Get more info on visiting the Coogee Pavilion here and on the perfect day in Coogee here. 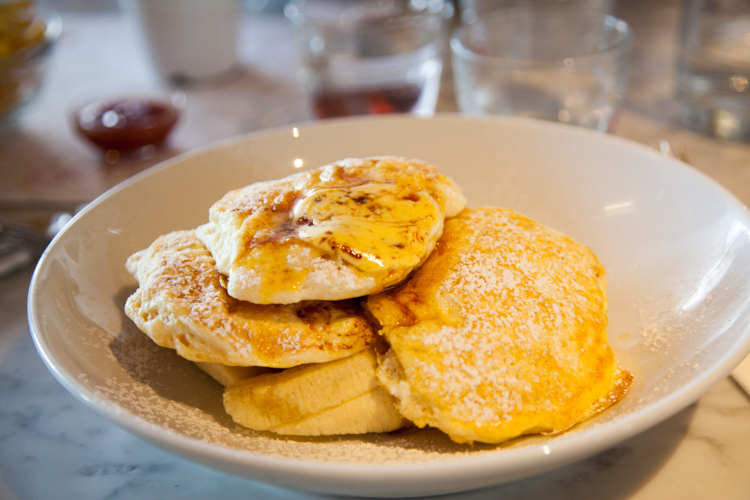 One of our go-to kid-friendly cafes in Sydney’s Eastern suburbs, Grandma’s Little Bakery serves up home-style cooking and baking in a cosy, friendly environment. Their concept is “bringing together flavours & loved recipes from real Grandmas & Grandpas from all over the world”, which I found very sweet. Try their famous Shakshuka (2 eggs served on a hot pan, olive oil with added ingredients like feta or spinach, served w/ Bread). A standard all-day breakfast menu plus soups, salads, sandwiches and pastries are also on offer. Kids adore getting their milkshakes and juices in the bear-shaped mugs – if you can tear them away from the play space, that is! Order a meal from acre, the sustainably-focused eatery at Camperdown Commons, while the kids play nearby. Diners can choose between a large, sit down restaurant and bar, container with takeaway coffee and snacks and a casual outdoor area on the terrace or lawn area outside. Many of the ingredients in the dishes come directly from the pocket gardens onsite, making the dining experience very literally farm-to-table. Families will particularly love the outdoor area with its interactive kids’ play space and chicken coop where rescue hens from battery farms now live a life of luxury. 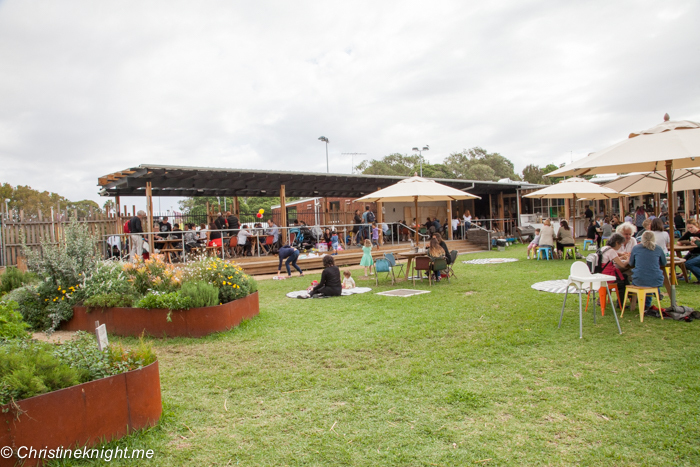 Get more info on visiting Camperdown Commons here. 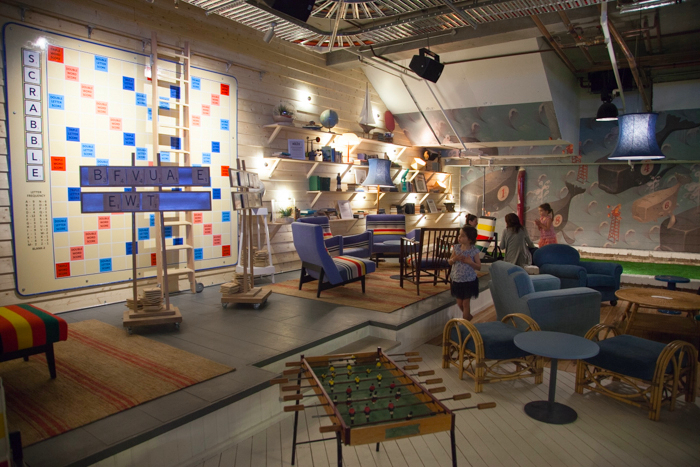 Located at Harold Park, The Tramsheds is a must-visit for kids who are obsessed with wheels. 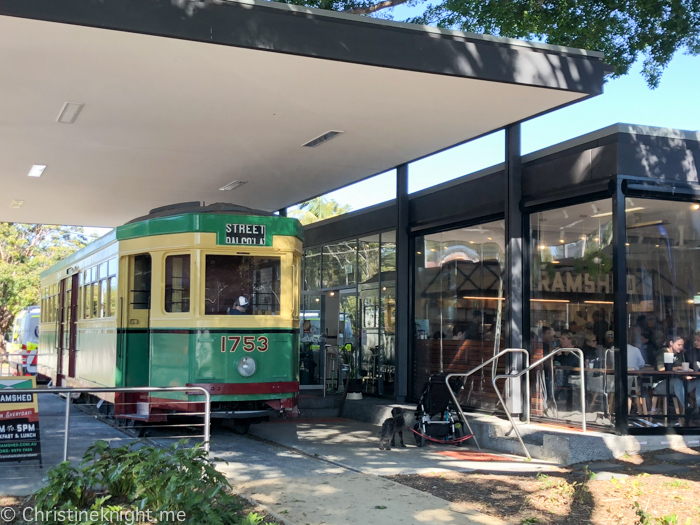 The old Rozelle Tramway Depot, originally built in 1904, has been beautifully refurbished and given a new life as a hub for restaurants and facilities for local residents. The full-sized resorted tram inside the Tramsheds is now part of the dining area for the Butcher & The Farmer cafe, so you can ask for a table inside and let your little one pretend to drive it while waiting for their babyccino to arrive. Get more info on our visit to the Tramsheds here and all the kid-friendly dining options it offers. While the Vogue Cafe sits inside busy Macquarie Shopping Centre, from the inside it feels like Wonderland. It’s an adorable, whimsical place, with a straightforward menu and fantastical shakes. 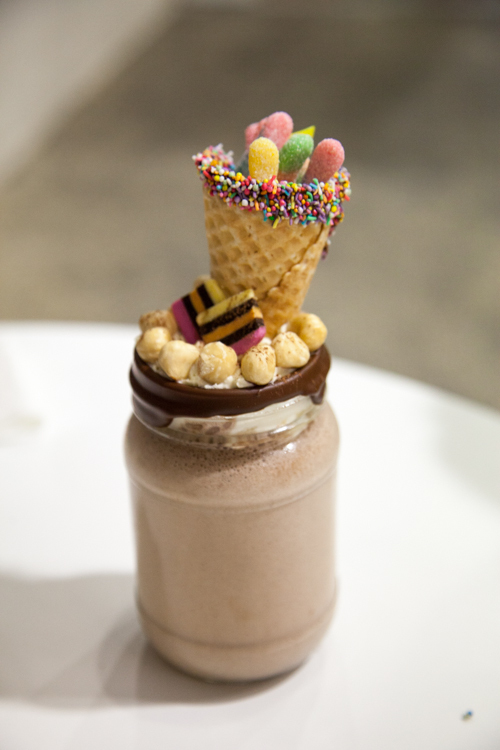 Called “Magical Milkshakes”, they are topped with things like whipped cream, rice bubbles, pop corn and jelly snakes, with a chocolate and sprinkles rim. The food is always delicious and the staff friendly. 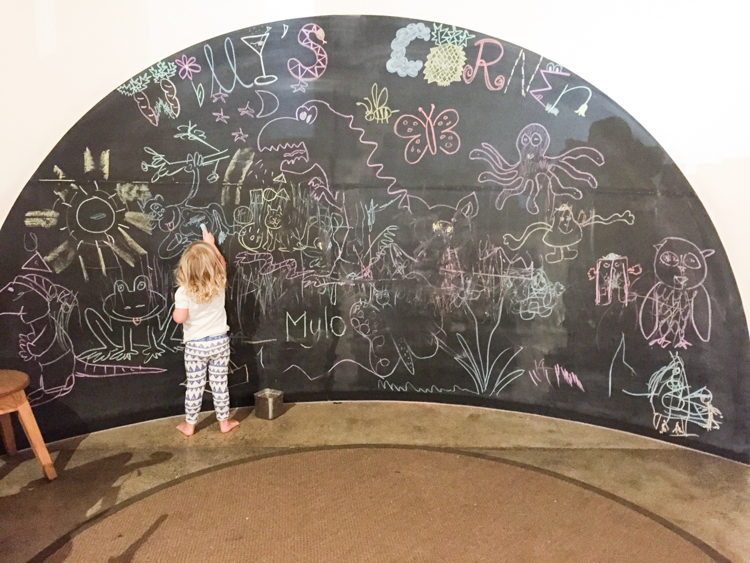 A small, enclosed play space has been a welcome addition to the cafe by families of younger kids. Read more about our visit to the Vogue Cafe here. When you want hotcakes, you go to Bills, even if you have kids in tow. What I really enjoy about Bills is happy and easy-going vibe. The friendly staff bring little ones coloured pencils and paper to entertain them while you wait for your brunch. Scrambled eggs or boiled eggs and toast soldiers will keep the little ones happy from the breakfast menu, or order a linguini, junior burger or schnitzel for lunch. Their French fries are also excellent. 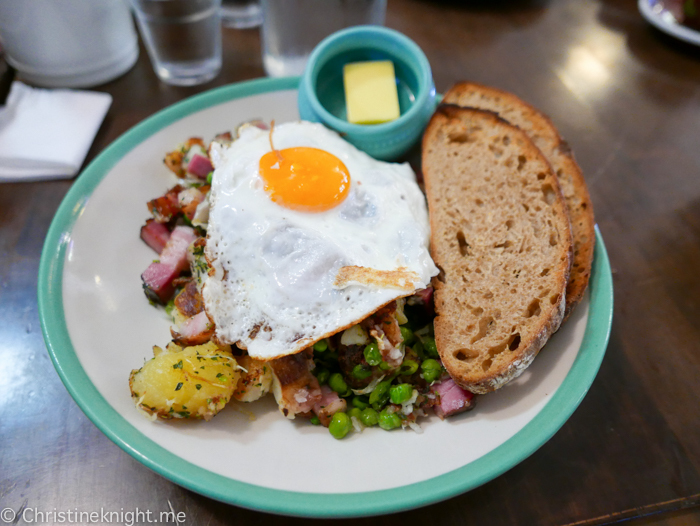 Read more about our visit to Bills Bondi here. 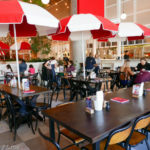 This big, bright and bold restaurant is an excellent edition to Darling Harbour, situated near the ICC building. The seating is casual – grab a table and order at the bar. There’s plenty for kids to look at, including the pizza kitchen and fresh pasta station, plus a games area (best suited for older kids) and house-made dessert and gelato counter. The kids’ menu is massive and has something to suit everyone, rather like the menu for adults. Keep an eye out for special kids eat free deals. A few steps outside Fratelli Fresh is the excellent Darling Quarter playground. 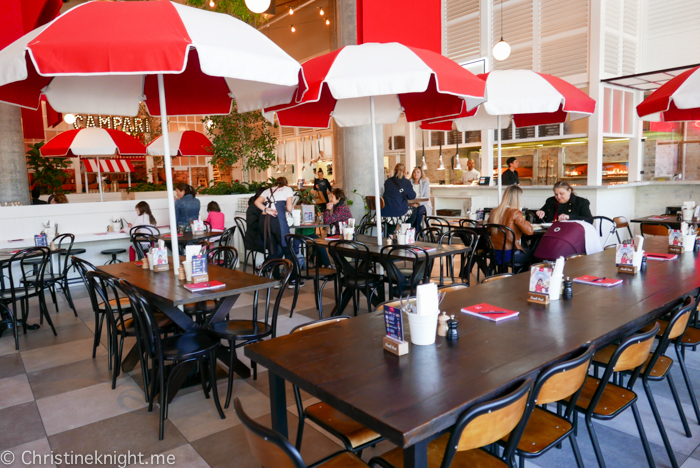 Read more about our experience at Fratelli Fresh Darling Harbour here. 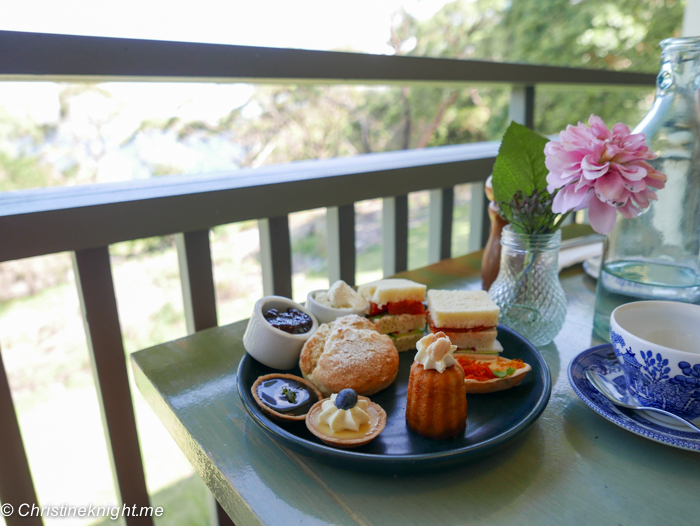 Hop aboard a beautifully resorted 1930s tram at this bright and cheery cafe on Narrabeen Lake. 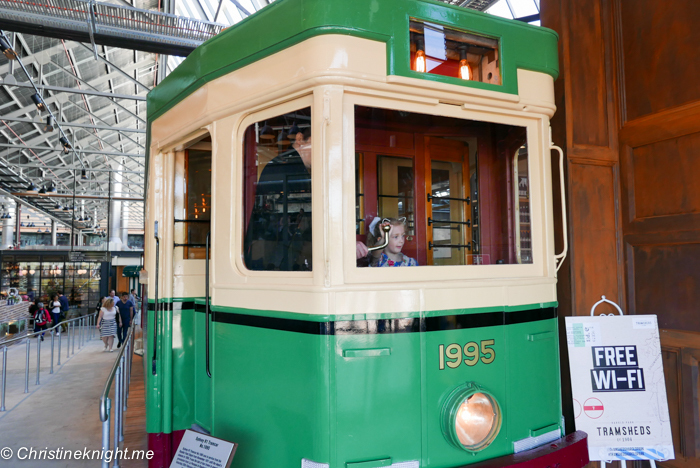 Not only is the tram excellent fun itself, the cafe serves up delicious Modern Australian cuisine and offers its youngest diners and excellent kids’ menu. 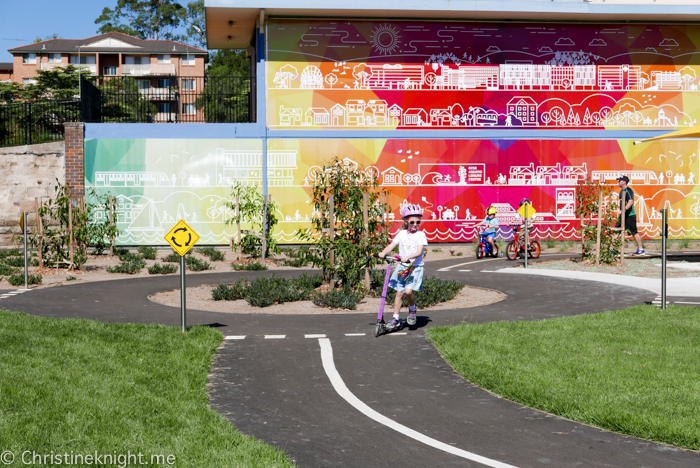 A large playground is situated outside the cafe, and the Narrabeen Lagoon Trail starts directly behind the cafe, making it the perfect outing for families. Read more about our visit to the Tramshed Cafe here. The Cove Dining Co cafe is located inside the community hall of what was once the Abbotsford Nestlé factory site, a heritage-listed building. The dining room is spacious, with long tables, or choose alfresco seating on the outdoor verandah with a lovely view of the lush gardens surrounding the building and let the kids play while they wait for their meals. This is one incredible family-friendly cafe, as evidenced by how accessible it is for strollers and wheelchairs, and provide use of highchairs, baby change tables, toys and colouring in equipment. Read more about our visit to The Cove Dining Co here. This retro 1950s-style diner packs a sweet punch. 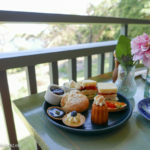 Enjoy a delicious range of breakfast and lunch dishes, plus fancy milkshakes and their famous “Low Tea” (read more about the Low Tea here). 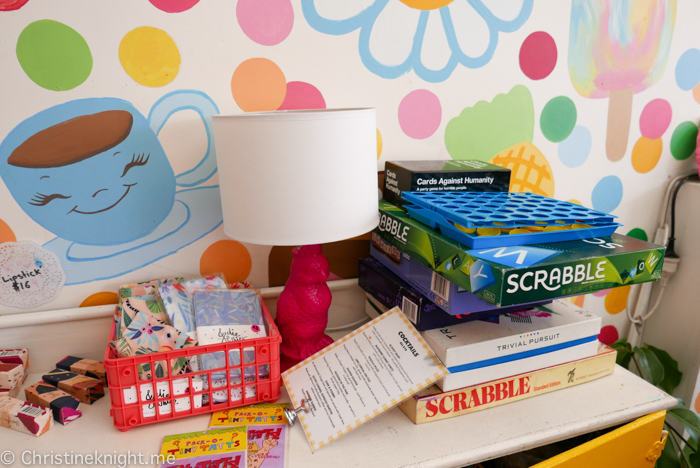 Kids will adore the cute decor, games and colouring in supplies that can be brought to the tables, and the pick and mix lollies at the counter. 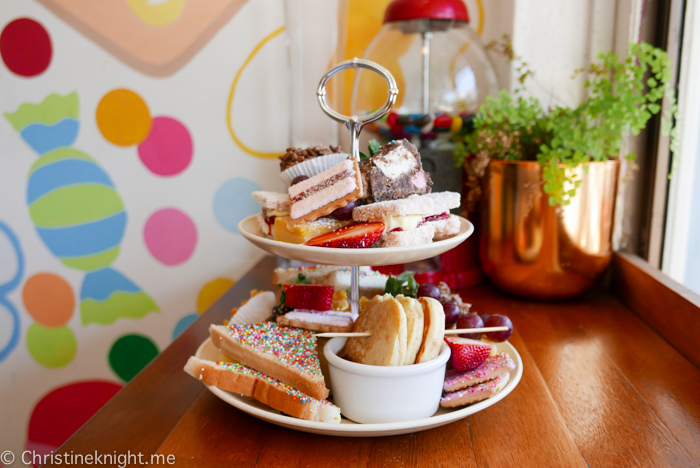 Read more about our visit to Daisy’s Milkbar here. The celebrity chef’s relaxed Italian dining chain is our go-to when dining with kids in Sydney’s CBD at night. 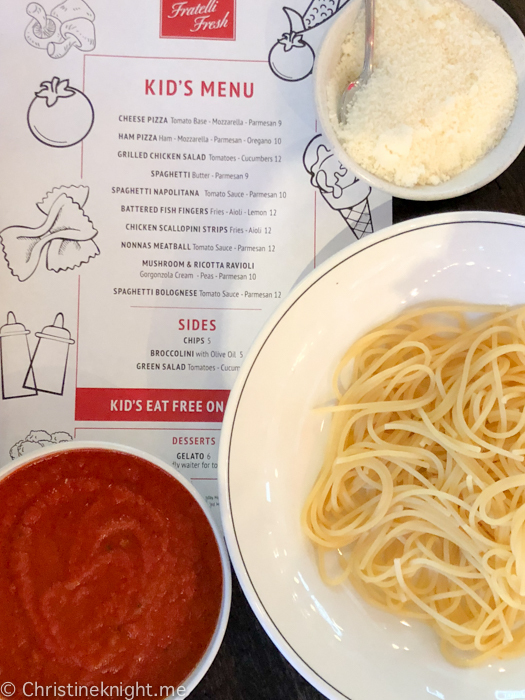 The rustic menu, handmade pasta and antipasti bar appeals to adults, while kids get a fantastic dedicated menu that includes a cute little salad in a jar, and offers pasta sauce with hidden veggies. 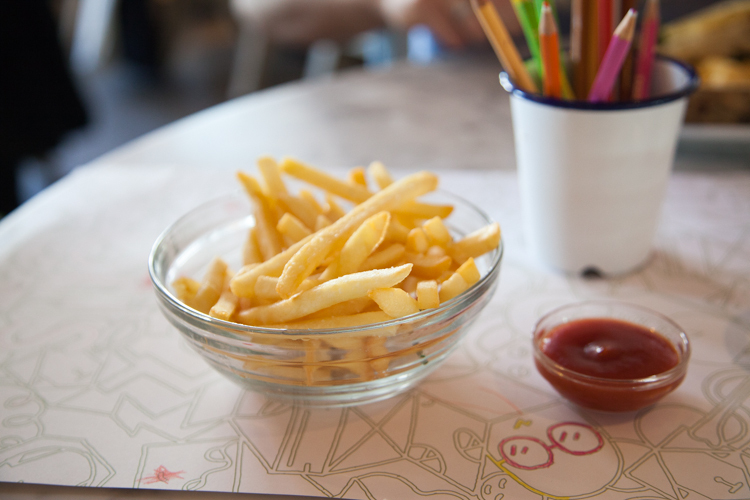 Colouring sheets and pencils are also on offer for tiny diners.